Wendy's 3-D Cats: 3-D CATS IN HATS THEY MAY BE! 3-D CATS IN HATS THEY MAY BE! The 3-Ds are causing a little MAYhem around the neighpurrhood by modelling their latest warm weather accessories. They cause quite a stir efurrywhere they go! 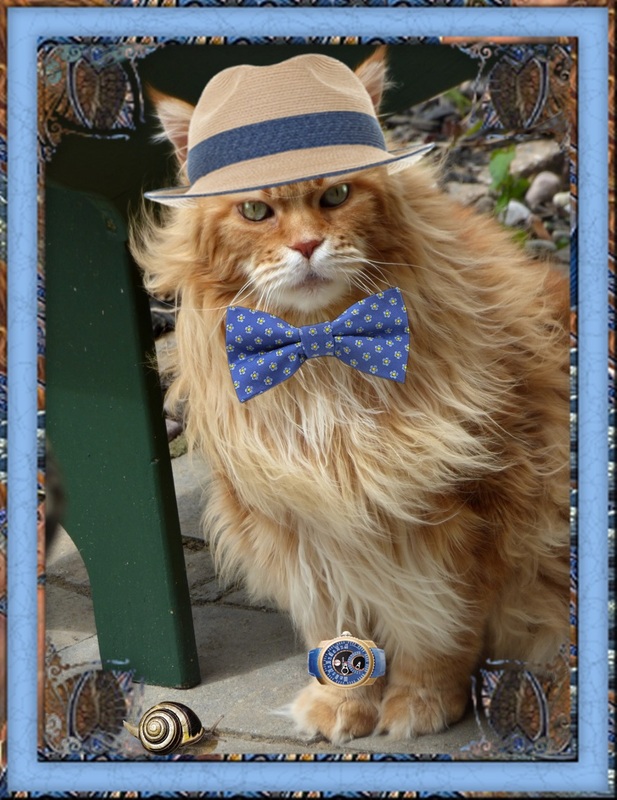 Dante's looking handsome in a straw fedora with cornflower blue band and trim. 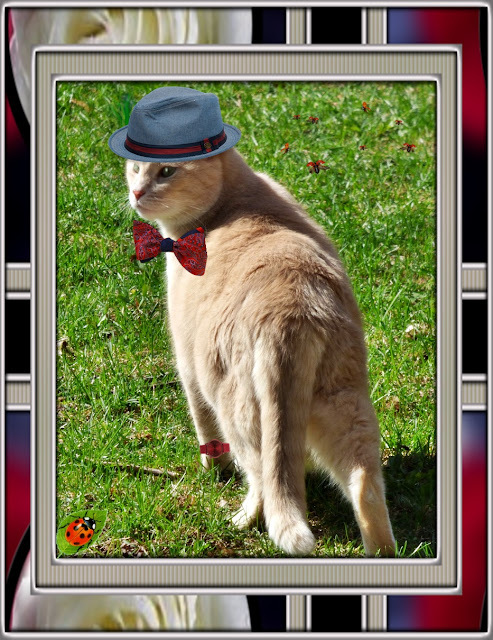 He has paired this with a like-coloured bowtie dotted with little daisies. His Gerald Genta watch ties in, too (just like his bowtie). A snail from the garden is pressed for time, and is trying his best to see Dante's watch, but if he takes too much time over the time, he's going to run out (of time, that is). He's going to be late for a very important date if he doesn't speed up. "Doan know wot's wrong but I'm feelin' kinda sluggish today." Domino is lovely in her wide-brimmed straw hat with mauve band and flower adornment. 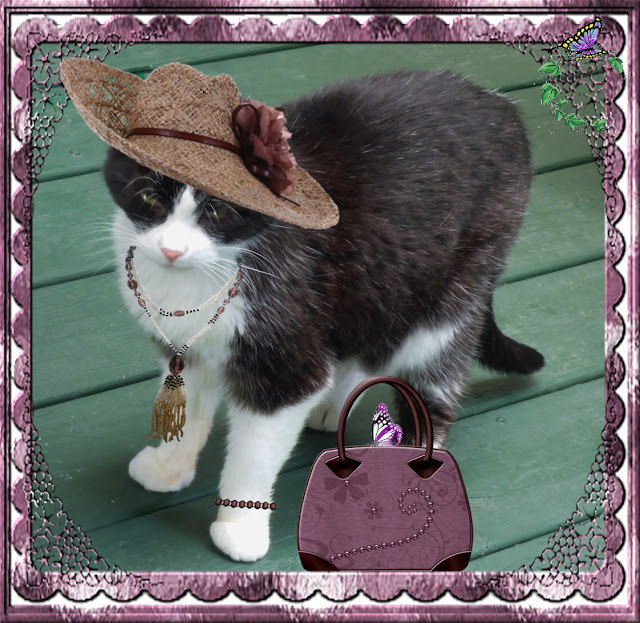 She is wearing a flappurr-styled beaded necklace which coordinates purrfectly with her hat. She has also chosen a simple bracelet with purple stones, and a mauve-coloured handbag to complete her look. She is partial to butterflies, and they to her. Her purplish accessories have drawn in a couple of new flighty friends today. They must think she's a flower! "All dat glitters is not gold", says Domino. "Butterflies is part of da noo glitterazzi an' dey comes in all sortsa colours!" Dylan is striking in his blue denim fedora with red and navy band with a red and blue paisley bowtie at his neck. He is also sporting a red watch backwards on his wrist, just to be cool. There are a number of ladybugs flitting about today; some in the air, and some in the grass. They must think Dylan is a gentleman-bug or something because they sure seem attracted to him. It must be his star quality! "We hates ta bug yoo, but cud we have yoor ottograph?" ask the ladybugs. Y'all out did yourselves with the fancy today! DANTE & DOMINO: STEPPING IT UP! 3-D CATS IN HATS COME WHAT MAY! DANTE & DYLAN: AYE, AYE CAPTAIN! 3-D CATS IN HATS ON THE FIRST OF MAY!